Previous issues of Nuts & Volts introduced the Mentor’s Friend: a retro computer that you can build yourself and program in BASIC. 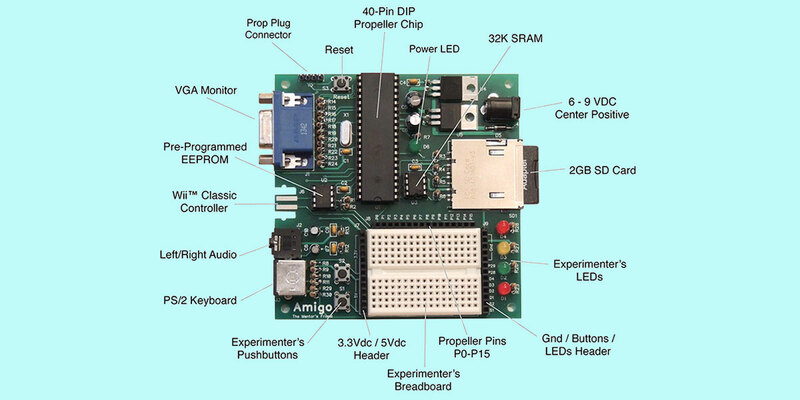 The “Amigo” was designed as a home-built mentoring platform you and your child or grandchild can use together to explore computers and programming. Here are five more easy Amigo projects for you and a young protégé. These have been selected to continue a hands-on introduction to Color BASIC, while preserving the necessary ingredient of “fun.” Enjoy! One of the first things my grandkids wanted to do with their retro computers was just type text on the screen. This helped their keyboarding skills, and more importantly it got them spending a little “alone time” with their new computer friend. Here’s a program that displays keystrokes on the monitor, with the bonus of changing the text colors as needed (Figure 1). FIGURE 1. It’s surprising how engaging a simple keyboard and monitor can be. Use the Editor (press <F1> at the flashing cursor) to enter the code below. Take your time! This is a “real” program, and there’s a bit to it. If you’re working with a young one, you may ask him or her to help by entering all the lines with a COLOR command, or some similar division of labor to keep them engaged. Take a couple of breaks if needed — don’t let the tedium of code entry destroy the fun of the adventure! Once you’re done, press <F1> again to return to Color BASIC, then <Esc> to interrupt program flow. SAVE the code as “TYPE-IT.BAS,” then RUN the program through its various features and functions to find and correct any typos. (You’re very special — or very lucky — if you have none!) Don’t forget to SAVE again after your corrections. This is a lot of keyboard work, and you want to protect your investment. Once everything is working, you should have a little program that presents an instruction menu for function keys F1 through F6. It then allows your “student” to type text in various colors on a screen color of their choice, clearing the screen, changing colors, or printing a smiley as needed. It may seem unexciting at first (no animation, no multi-gesture swiping, etc. ), but my grandkids seemed to truly enjoy typing their own little jokes and short stories with a real keyboard and screen. If you’ve worked through the Color BASIC projects in previous issues of this magazine, most of the code in this program should make sense on your first read-through. However, this project is probably close to some that you will build later on, so a general walk-through of the code may be in order. Lines 10 - 42 initialize the text foreground (f), text background (b), and screen (c) color variables to white on blue, then REDEFINE the right and left brace keys (ASCII 125 and 123) to a smiley and a purpose-built character for changing f and b. Lines 50 - 70 set the text colors and call the Print Commands Screen subroutine at Lines 1000 - 1095. Like any subroutine in Color BASIC, program flow jumps from the calling GOSUB (in this case, Line 70) to the specified line number (Line 1000), then from the RETURN (Line 1095) back to the line following the GOSUB (Line 80). Lines 80 - 200 comprise the main loop of the program, which converts keystrokes into program commands or characters on the screen. Lines 110 - 140 check for Function Keys 1 (ASCII 208) through 6 (ASCII 213). If these are not found, program execution continues at Line 150. If F1 through F6 is presented, Line 130 sends program flow to the appropriate subroutine. Then, Line 140 jumps to the top of the loop for another keystroke. Note the use of the expression (k-207)*1000 in Line 130 to select the proper subroutine. In Color BASIC, both GOTO and GOSUB can use expressions like this, as well as explicit line numbers. Lines 150 - 160 provide the program with an important capability: the ability to backspace to correct errors. If the keystroke is a <Backspace> (ASCII 200), Line 160 displays an ASCII 8 (move the cursor back one space), an ASCII 32 (print a space over the current character), and an ASCII 8 (move the cursor back one space again). This is a bit confusing at first, but it makes sense after you think about it. After eliminating the offending character, program flow jumps back to get another keystroke. Lines 170 - 190 print the character glyph of any remaining keystroke value, then goes back for another keystroke. This process continues until the program is ended by the F6 command. Now, let’s take a look at the subroutines. Lines 1000 - 1095 print the commands screen, which lists the active function keys and the function each performs. Note the use of GOSUBs in Lines 1005 and 1055 to avoid duplicating code. (Subroutines can “nest” one inside another five deep in Color BASIC.) The strange numbering on Line 1095 and the other RETURN statements are there because I first put a program “stub” in for each subroutine when developing my code — just the REM statement label and the ending RETURN statement. This lets me set up and check my program framework first, and then build (and improve) the functional modules after program flow has been validated. Lines 2000 - 2095 clear the screen in the screen color c, then set the text colors back to f and b. Lines 3000 - 3095 display a change-text-colors indicator (a rectangle containing a dot) in the current colors, then allow the user to change colors with the arrow keys, pressing <Enter> to return to typing mode. The left and right arrows (ASCII 192 and193) decrement or increment f; up and down (ASCII 194 and 195) increment or decrement b. After setting the text colors to the new value and backspacing over the change-color indicator, program flow loops to the top of the routine unless the <Enter> key (ASCII 13) has been pressed. This design has less user prompting than I like, but doesn’t require us to separately track the cursor in our code. Lines 4000 - 4095 erase the current screen, present the color value set in the assigned colors, and prompt the user to select a new color. Note that in the call to the clear-the-screen subroutine in Line 4040, all variables are shared among subroutines in Color BASIC. So, the value of c set in Line 4035 is available to Line 2005 without any explicit passing of variables. Lines 5000 - 5095 simply print a smiley at the current cursor location, in the current foreground and background text colors. Lines 6000 - 6095 end the program, first getting user confirmation, then resetting the redefined characters and screen color, then clearing the screen and printing a READY prompt. The RETURN in Line 6095 is never executed, but left in there for consistency. You should find it fairly straightforward to add features to this code that you and your protégé come up with — more emoticon function keys is a good place to start. If you haven’t done so yet, check out the REDEFINE.BAS program that ships with the Amigo kit (available through the Nuts & Volts webstore). It should help with developing REDEFINE statements for any new glyphs you implement. Also, please consider using TYPE-IT.BAS as a starting point for similar programs you build, perhaps with a completely different topic. Just LOAD “TYPE-IT.BAS,” SAVE it with the name of your new program, then open the Editor and start hacking the code. Have fun, and don’t forget to save your work! If you have a Wii™ Classic Controller (not the nunchuck), you can use it with your Amigo to increase the number of fun things your programs can do. The secret is the Color BASIC JOY command, which works like INKEY, but for the controller buttons instead of keyboard keys. Now, connect your controller to the Amigo (the indented side of the connector should face up) and RUN the program. In addition to the title and simple instructions, you should see the non-zero value returned by the JOY command when you press any button. If the program doesn’t seem to work when you first run it, check your cable connector (indented side up! ), then reboot your system (press the reset button, or type REBOOT at the flashing cursor prompt). That should get you in business (Figure 2). FIGURE 2. 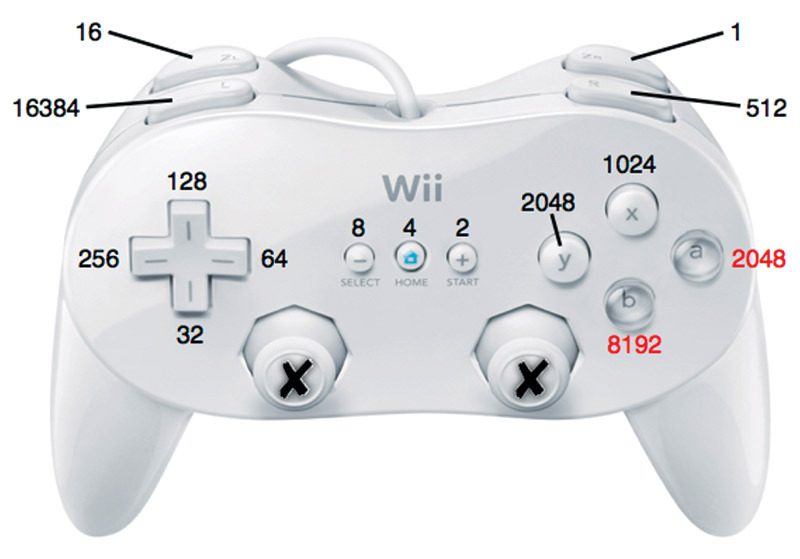 The Wii™ classic controller, showing values for each button. Note that Color BASIC does not recognize the joysticks, just buttons. You should notice that the JOY command returns the value of any button pressed, or zero if no button is pressed. (See Figure 2 for the numbers Color BASIC assigns to each button.) Also note that when two or more buttons are pressed at the same time, JOY returns the sum of their assigned values. The a and b buttons always override any other buttons, with a always taking priority over b. Also note that Color BASIC does not recognize the joysticks on the Wii controller — just the buttons — and the controller must be connected to the Amigo before the system is started. The Color BASIC screen has 100 graphics columns, numbered 0 to 99, and 75 graphics rows, numbered 0 to 74. The PLOT command has the syntax PLOT <column>, <row>, <color>; this code simply uses button values from the controller to update where a graphics point is plotted and in what color. 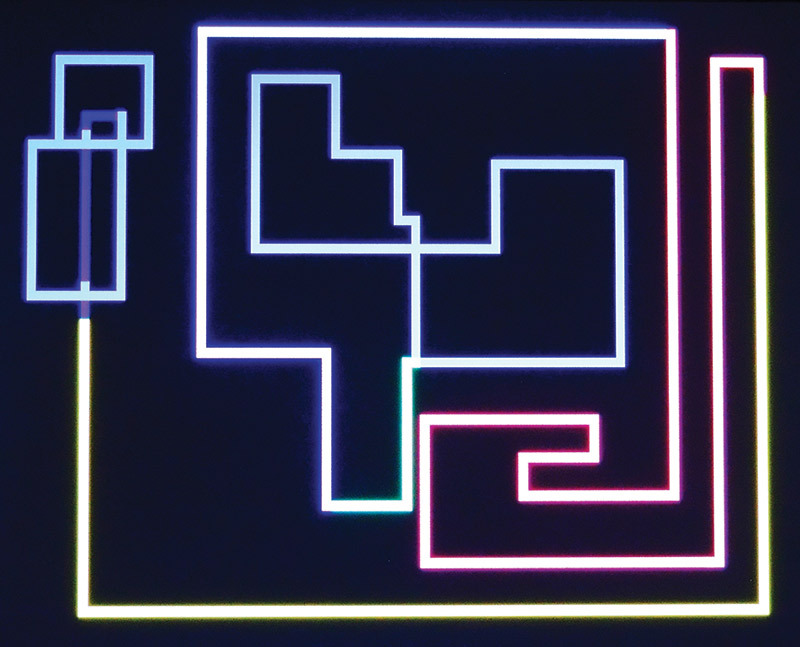 The result is a maze of brightly colored lines on a black screen. Like our previous typing program, at first glance this does not seem very exciting, but it’s surprisingly engaging to young ones — at least until the new wears off (Figure 3). FIGURE 3. Using the Wii™ classic controller with DRAW.BAS. The colors are much more vivid than those in this photo. If your youngster is intrigued by this little bit of code, here’s a challenge from me to you; Use the main loop in this code snippet to rewrite TYPE-IT.BAS into DRAW-IT.BAS. Include controller buttons for a commands screen, changing cursor and screen colors, clearing the screen, printing a smiley, typing a text snippet, and any other features your helper might want. I bet you’ll find this easier than you think, and it should be a great joint project! When you run the code, you’ll be prompted to enter the low/high ranges for the multiplier and multiplicand, and then press a key to start the drill. You’ll then be presented with 10 random problems, one after another, with immediate correct/incorrect feedback after each one. You are then given the option to practice again or change the ranges. By now in your Color BASIC journey, most of this code should be intuitive to you, but a couple of things deserve mention. Lines 85 - 110 serve to randomize the Color BASIC random number generator, which (like most software RNGs) isn’t truly “random.” Without this code, the random number stream after each program start-up will be the same, and problems presented for like ranges will appear in the same order each time. By using the “random” time it takes for the user to press a key, the RNG is set differently each time the program starts, with different problems for the same practice ranges. It will be fairly simple to modify this program for addition instead of multiplication, and subtraction and division are possible with a little thought. If you get really ambitious, you could modify the framework of TYPE-IT.BAS to include all four arithmetic operations. At any rate, I hope your student enjoys this program! When you run this program, you should see a prompt to enter two integers. When you do, the program lists the results of each Color BASIC arithmetic, comparison, and logical operation on those integers. The five arithmetic operations always return a 32-bit integer value. The six comparison operations always return either a -1 (the comparison is TRUE) or 0 (the comparison is FALSE). The three logical operators of NOT, AND, and OR also return either a -1 or a 0 value. Note that Color BASIC supports bitwise operators, but they will be discussed in a future article and are not covered here. So, that completes five more easy projects for the Mentor’s Friend! I hope your Amigo and Color BASIC are bringing big smiles to you and any young helpers, and that you are starting a list of projects to tackle with this cool little platform. Future Mentor’s Friend articles will discuss some simple (and fun!) hardware interface projects for your Amigo. The Mentor’s Friend is a retro computer that you build yourself and program in BASIC. It is easy to build and fun to play with, and it offers a superb technology mentoring platform you and your child (or grandchild) can build and use together to explore computers and programming. What if you could build your own technology mentoring platform in a single afternoon, then spend hours of fun with your child or grandchild making simple computer games or exploring computer-controlled hardware circuits together? Utilizing the Amigo retro computer, here are some fun projects to get you started on a technology adventure, exploring computers and programming. Five more learning projects for the Amigo retro computer that will keep the fun going for you and your young protégé. Venture outside the Amigo retro computer and Color BASIC to interface with a couple of simple hardware circuits.